Haydn Porteous is one of the most exciting golfers to emerge from South Africa in a long time, and he’s shown he has what it takes to compete and win on the world stage. 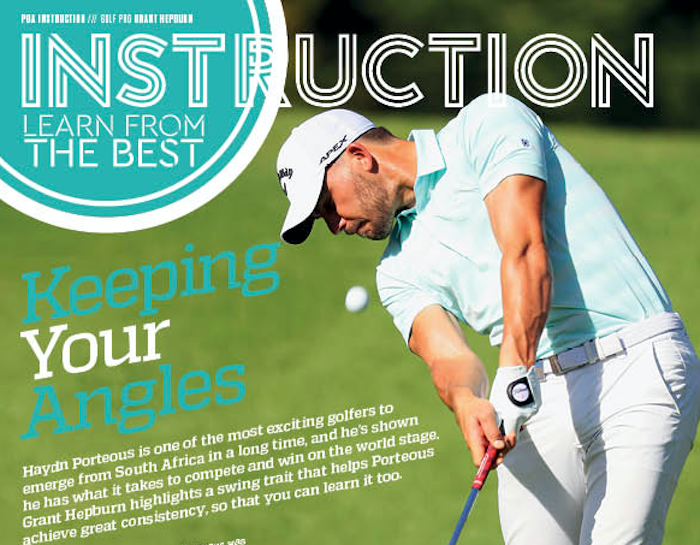 GRANT HEPBURN highlights a swing trait that helps Porteous achieve great consistency, so that you can learn it too. It wasn’t very long ago that Porteous was the No 1-ranked amateur in the country and it has been wonderful to watch him achieve success in the professional ranks. He has a strong all-round game built around a fluid, powerful golf swing. One of the things he does exceptionally well, and from which you can learn, is he keeps his body angles beautifully throughout the swing. club to the right place each time. 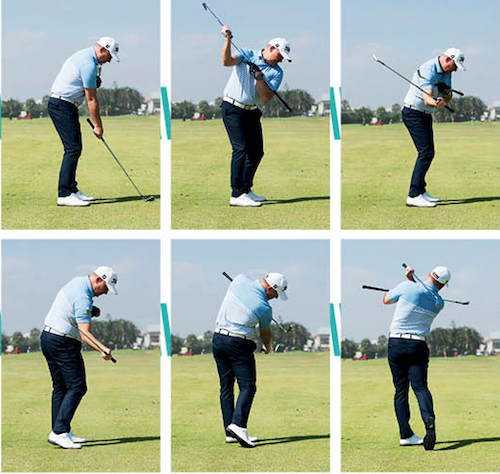 Also, in his downswing, Porteous moves his shoulders on the correct plane, which enables him to keep his body angles and to deliver the club on the correct path into the ball. Having set up solidly, notice how, at the top of my backswing, the angle I have created from my shoulder to hip to knee is similar to what it was at the address position. As I initiate my downswing, note how my right shoulder moves under my chin, which helps to keep my arms moving on the correct path. As I approach the impact zone, you can clearly see how my right shoulder is under my chin, allowing me to maintain the angle in my spine. In the followthrough, my right shoulder continues its path under the chin and my body angles remain similar to what they were at address. This drill should help you learn how to keep your angles throughout the swing. Start by holding a club across your chest with your left hand, with the grip on the left and the head of the club on the right. Grip another club with your right hand as if you are going to make a one-handed swing. 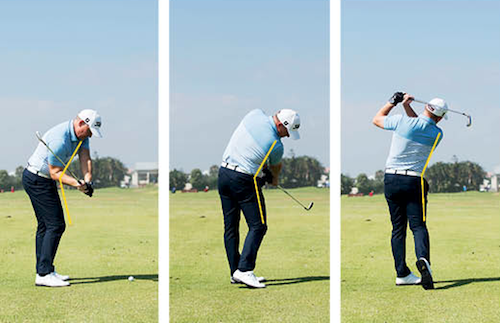 Make a steady backswing, then start your downswing, ensuring that your shoulders move correctly in the downswing. Your left shoulder should move up and your right shoulder moves underneath your chin, as shown in the sequence. This drill provides a good visual reference because when you do this correctly, the left side of the club (grip end) will move upwards as the right side (clubhead) moves under the chin. 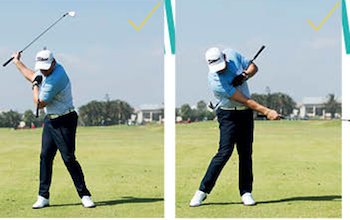 A classic mistake amateurs make is for the right shoulder to move out and around towards the ball in the downswing, which throws the arms and club away from the body. 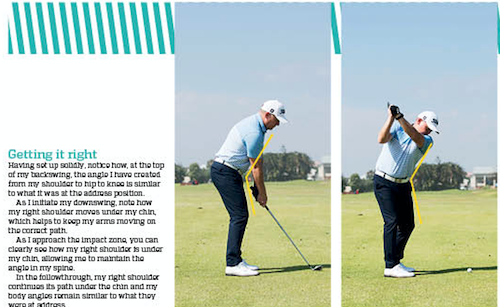 So instead of seeing the clubhead drop under your right shoulder, you will see it out in front of you. 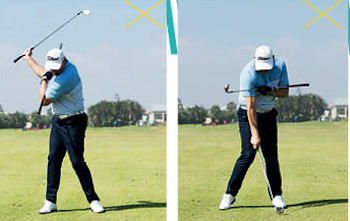 This move leads to a loss of angles in the body, and the club and arms swing across the ball – making power and consistency difficult to achieve. 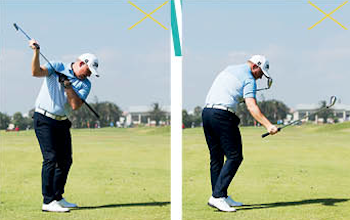 When you look at the drill from face on, you can see how the shaft across the shoulders illustrates the correct shoulder movement, where the left shoulder moves up and the right shoulder moves under the chin. This allows the body to keep its angles, with the head behind the ball, and the club can be released directly towards the target for maximum power and consistency. In this sequence you can see that the shaft across my chest is in a different position, almost parallel to the ground. My left shoulder is much lower and my right shoulder has moved out and around. As a result, my head has been pulled forward, my body has lost its angles and the club cannot be released down the line towards the target, but instead swings across the body from right to left. This leads to a loss of power and consistency. *Grant Hepburn has been a regular face in Compleat Golfer for more than a decade. His CV includes time coaching on the European and PGA Tours, and an impressive list of top amateurs and pros. He is the CEO of Golf RSA and the South African Golf Development Board.